What is the Certified Angus Beef ® brand? The Certified Angus Beef ® brand is a label recognizing the best Angus beef: always tasty, tender and juicy. Other labels may say Angus, but that’s where the similarities end. The brand, established in 1978, is truly a stamp of exceptional quality, and your sign of a great meal. We work with family farmers and ranchers to help them raise the very best Angus beef, and monitor its progress through every stage of the journey. In fact, our bosses are in boots: Certified Angus Beef LLC is a nonprofit owned by the American Angus Association® and its farmer members. Certified Angus Beef LLC is a team of beef-loving employees and we understand the beef community from farm to fork. We own the Certified Angus Beef ® brand logo, not cattle – that’s where family farmers and ranchers like these come in. In fact, the brand was created by Angus farmers to support their efforts to raise premium Angus beef, satisfying consumers while helping ensure ranching families could sustain their treasured way of life. The team behind the brand works with farmers, ranchers, packers, distributors, chefs, restaurants, grocery stores and butchers to ensure all Certified Angus Beef ® brand product exceeds your expectations. How does beef earn the Certified Angus Beef ® brand label? The Certified Angus Beef ® brand ensures incredibly flavorful, tender and juicy beef due to high amounts of marbling in every cut. Only the best of the Choice and Prime grades is considered for our premium label. Then beef must pass the brand’s 10 science-based specifications for quality. And, it’s not up to us to decide whether beef makes the cut: that’s the job of independent, unbiased U.S. Department of Agriculture graders. Only truly exceptional Angus beef earns the distinctive Certified Angus Beef ® brand label. We don’t just say the Certified Angus Beef ® brand is tastier than anything else you put on your plate - we back it up with fact! Is your beef really from Angus cattle? Angus cattle, which are known to produce higher-quality beef, are typically black in color. This black hair trait is a strong indicator of Angus genetics, and has become the USDA standard by which cattle are considered for all Angus brands and products. Beef that qualifies for any Angus brand, including ours, is determined not by pedigree, but rather by traits, like hair color, that are highly associated with the Angus breed. For some brands, like the Certified Angus Beef ® brand, Angus heritage is just the starting point. In addition, we have 10 exacting quality standards, which ensure only consistently flavorful, tender and juicy beef earns our brand name. Our Angus heritage is important to us, because Angus farmers and ranchers actually own the Certified Angus Beef ® brand, and created the vision for our high-quality beef more than 40 years ago. In fact, ours is the only brand owned by the American Angus Association®. We encourage you to “meet” some Angus ranching families bringing high quality beef to your table. 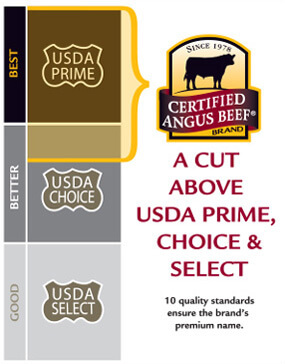 What USDA grade of beef is equivalent to the Certified Angus Beef ® brand? While there is overlap between U.S Department of Agriculture (USDA) grades of beef and premium brands like ours, there are some differences – and our standards have always ensured a great eating experience that goes beyond the USDA grade. The USDA first inspects all beef for wholesomeness and safety, regardless of the grade or brand it may earn. Then, most beef is graded by the USDA, to give consumers an indication of its quality. The grades of beef you’re likely to see are Prime (the very best), then Choice, then Select. USDA grades are primarily based on the amount of marbling – the small flecks of fat that melt during cooking and deliver flavor and juiciness. Beyond USDA grades, beef may earn our premium Certified Angus Beef ® brand name if it meets all of our 10 quality standards – the most important of which is marbling. Our beef must have at least as much marbling as the very best of USDA Choice or Prime, plus meet our additional requirements – ensuring it is truly a cut above. No. The Certified Angus Beef ® brand is available at a number of local grocery stores and restaurants, but it is not at Wal-Mart. There are many different beef products with “Angus” labels in the market today, but not all Angus is created equal. “Angus” is a breed of cattle, not an indication of beef quality. Angus-influenced cattle are an important starting point for our brand, but since 1978, the Certified Angus Beef ® brand has relied on 10 exacting standards that judge the taste and the quality of our beef. These standards ensure every cut of our beef is amazingly tender, incredibly juicy and full of flavor. Only 3 in 10 Angus cattle meet our high standards. Look for our logo to ensure genuine quality. How do you ensure the brand’s quality and integrity? The integrity of the product and your satisfaction are of utmost importance to us – so we’re in the trenches. We visit ranches and work with folks who bring beef to dinner tables around the world, and rely on a one-of-a-kind tracking system to make sure you get the quality you expect from the brand at restaurants and grocery stores. Our cattle specialists, chefs and beef experts are nearly everywhere … because we love beef, we believe in the superior taste and quality of the Certified Angus Beef ® brand, and we want you to enjoy it, too. When you choose beef for your family’s table, you can feel good about the dedicated families across the beef community who work hard every day to bring you their best. It’s not just a job, but a source of pride and a treasured way of life. Ranchers, like Debbie Lyons-Blythe, take the first steps toward getting healthy cattle and quality beef to market. Feeders and packing companies also play important roles in this mission. Chefs and retailers impart their own expertise to ensure you enjoy the beef on your table. Together, from farm gate to dinner plate, they ensure a plentiful supply of delicious, nutritious beef for your family, and their own families, too. Meet some of the fine folks we’re proud to work with within the beef community. How do you ensure humane handling? We work with family farmers and ranchers across the country who are committed to caring for their cattle and producing safe, wholesome beef for your family and theirs. They believe giving animals proper care and nutrition is not only their responsibility, but the best way to grow flavorful beef. In addition to following the beef community’s established standards for proper care and handling, they also keep up with the best practices in the field. We take great pride in working with the entire beef community on these efforts and join in their commitment to always bring the very best Angus beef to your table. What is the environmental impact of raising beef? Farmers are sometimes called “the original environmentalists” – no surprise, when you consider their life’s work is dependent on land, water and other natural resources. Specific to beef, it’s important to know there are many efficiencies in the U.S. today that have drastically reduced its environmental impact. According to Environmental Protection Agency data, raising beef contributes just 2% of U.S. greenhouse gas emissions. That’s the lowest percentage in the world, because of farmers’ and ranchers’ responsible practices that allow them to raise more meat using fewer animals, land, water and other resources than ever before. In addition, most land used to raise cattle isn’t suitable for growing crops like fruits and vegetables. View the fact sheet here* to learn more about beef sustainability. How does beef fit in a healthful diet? Beef is a powerful protein that helps fuel active lifestyles for all ages. And beef is the No. 1 food source for Protein, Vitamin B12 and Zinc – we like to think of it as nature’s tastiest multivitamin! Science continues to highlight the role beef plays in a healthful, well-balanced diet. It’s a great source of lean protein, too. There are lots of lean cuts, which include choices for every craving – look for “loin” or “round” in the name. Best of all, lean beef can help control cholesterol and maintain heart health. Which is better, grass-fed or grain-finished beef? All cattle are grass-fed and spend the majority of their lives on pasture eating grass. As cattle grow, grains like corn and wheat are added to their diets. This “grain finishing” enhances marbling in beef, giving it the great flavor we all enjoy. All beef, no matter how it was finished, is a good source of many essential nutrients, including zinc, iron and protein. And all beef is raised by farmers and ranchers who are passionate about bringing safe and wholesome beef to the table. As beef lovers, we appreciate all types of beef, and we believe this answer is a matter of taste.